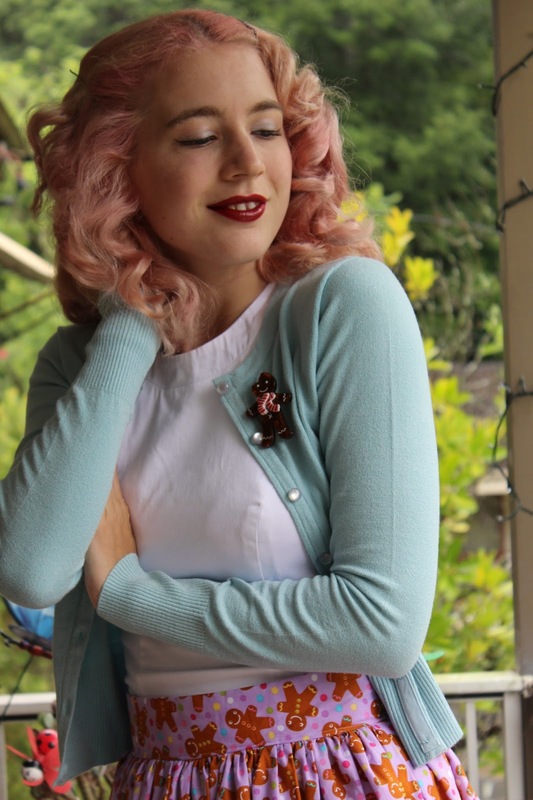 GracefullyVintage: Pastel Pink Hair and a Christmas Skirt Made by Me! 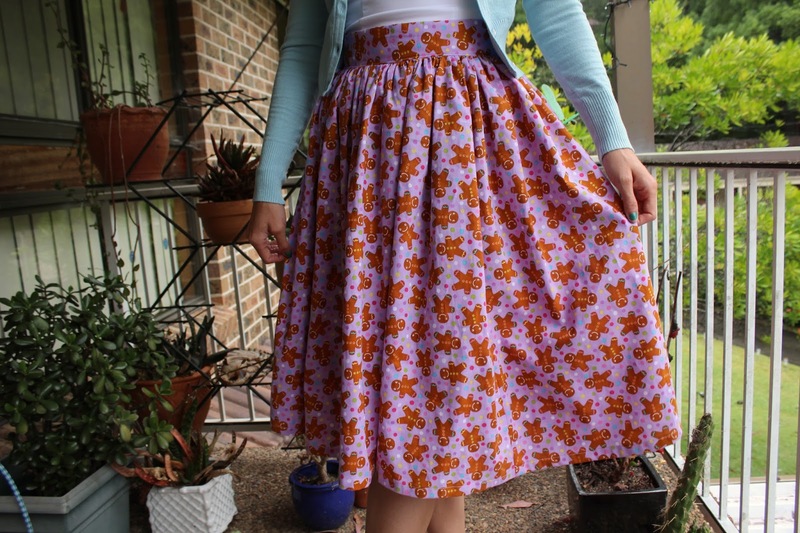 Here is the Chritsmas skirt that I have been mentioning in previous posts and yay it's finished! 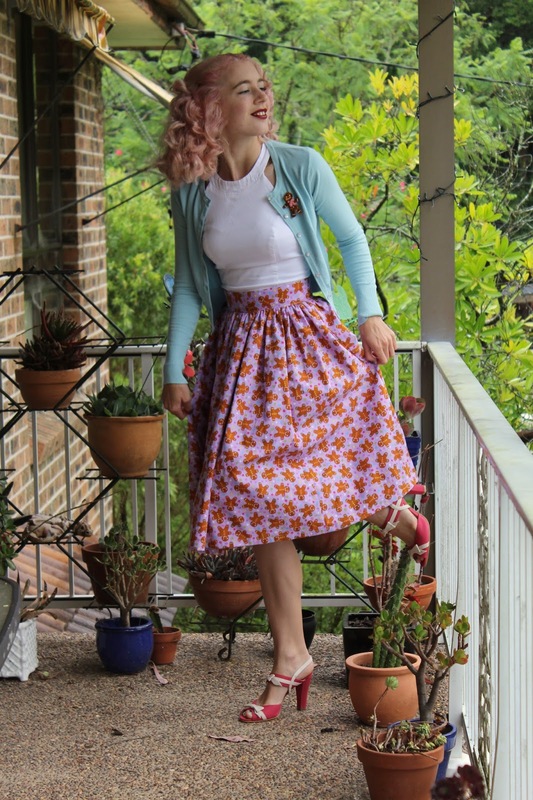 It doesn't take me long to make these skirts, I have just been short for time but I have been happily wearing it for the past week. Every year I usually buy a new Christmas fabric and I could not resist this when I saw it at the store, I also have the perfect Erstwilder brooch to match! I usually make Christmas dresses for myself but made the decision earlier this year that I needed a Christmas skirt and I'm really happy with how it turned out! Now onto the pastel pink hair, I have wanted to try it for ages and I'm glad that I did it this week as I love this pastel coloured outfit with the hair. I took these photos before heading out to do the last of my gift shopping and to see Star Wars (which was amazing by the way)! We had a couple of days of heavy rain so I'm glad that I could still get some photos. Back to the hair... The colour was brighter than this to begin with.. It was a great colour but I didn't like it on myself. I washed it a couple of times and got it to this lighter shade of pink which I quite like. It is now a very faint pink at the moment and doesn't have much time left come my next hair washing day. I'm not sure if I'll do it again but I'm glad I did as I don't have keep wondering what it would be like to have pastel pink hair, haha. 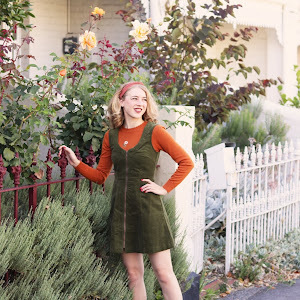 I'm thinking about doing an outfit round-up featuring some of my favourite outfits of 2015. I have never done one before and have enjoyed seeing other bloggers posts. I'm just about to prepare a cheese and fruit platter to have with family whilst watching a Christmas movie and then the carols. I can't believe that it's Christmas tomorrow! Oh and I'm wearing the skirt again, I have to wear it lots before it gets packed away for another year. To end this post I would like to wish you a Merry Christmas and I hope you have a wonderful day! The skirt came out AWESOME!!!! I am jealous of your skirt sewing skills. 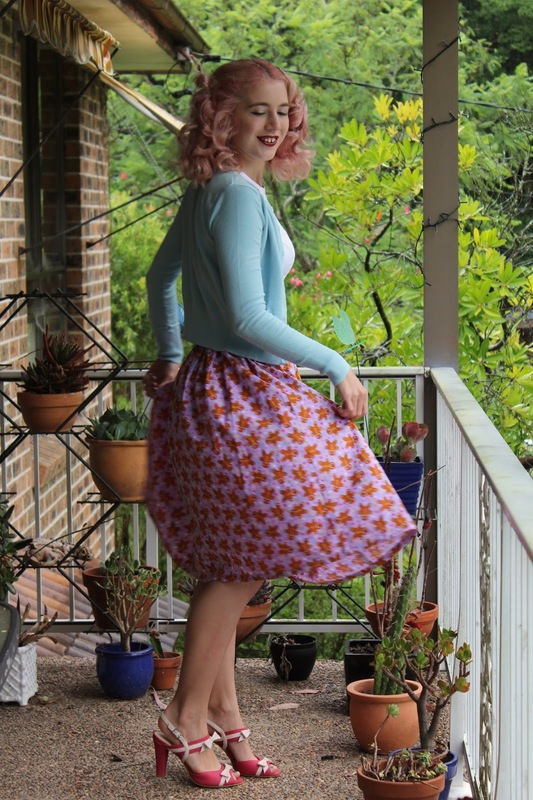 I tried back in high school and did make 1 skirt (it was pretty darn scrappy) but I am so impatient with sewing!! You look great! I love the hair color change too! I think this lighter pink shade is perfect on you, it's just subte enough. I really need to learn how to sew! Fabulously pretty hair!!! That gentle shade of pink compliments your colouring superbly. Happy Holidays Kayla! 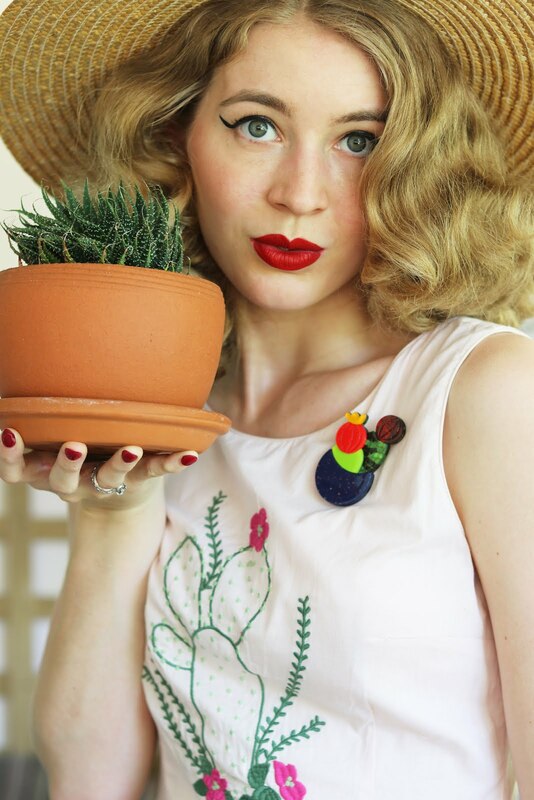 Your skirt looks so awesome and I love how well it goes with the Erstwilder brooch. I love the pink hair on you! 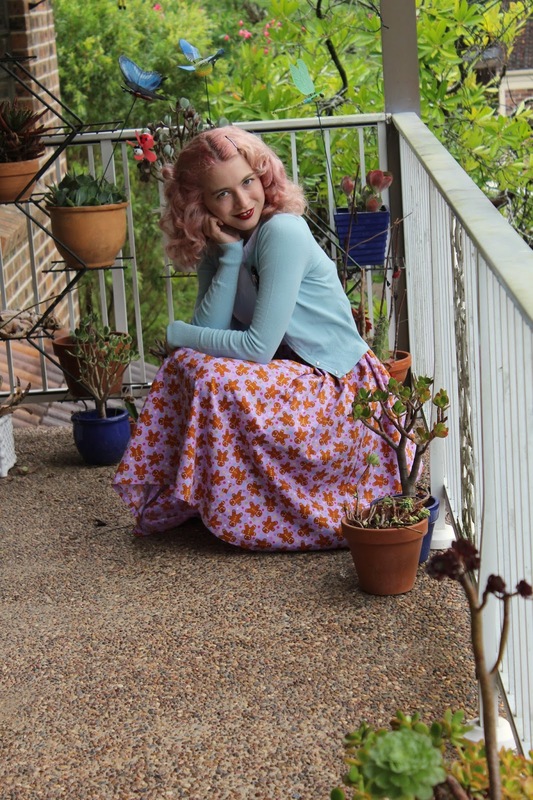 I love the pastel pink hair and what a perfect skirt! You are stunning!